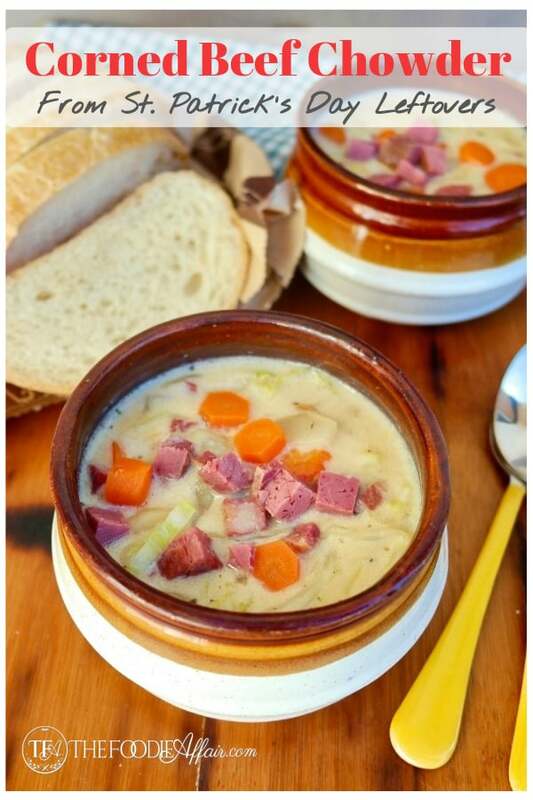 This Corned Beef and Cabbage Chowder is a delicious way to beat the chilly weather and use up any leftovers from your Saint Patrick’s Day feast! Creamy and flavorful corned beef stew is a meal you’ll look forward to every year! I’m so excited to share this creamy and hearty chowder recipe with you. This filling soup is made from the Corned Beef and Cabbage that I slow cooked last week. Do leftovers from meals you cook usually get buried in your refrigerator and long forgotten after the first meal? It definitely happens at our house! I really have to make an effort to not cook every night (who does that anyway?) and warm up what’s left for a second time at some point during the week. This chowder really takes leftovers to another level! From a hearty meat and potatoes meal to a creamy belly warming soup! After indulging in this transformation you will be hoping there are leftovers from the leftovers! My mother is the master of turning bland looking leftovers into a gourmet meal. I’ll never forget the way my husband raved about the meal she prepared when we brought our daughter home from the hospital (25 years ago)! We were hungry and my mom said that she would make something for us. We don’t remember having much in the refrigerator and Alan offered to go to the grocery store. Well, what he didn’t know and what I understand now is that you need to exercise the creative side of the brain to come up with a delicious meal using leftovers. I can’t remember what we ate, but I do remember the absolute wide-eyed astonishment of Alan’s expression when he saw the meal she prepared. “We had that in our refrigerator?! No way! ” Haha – he still gets happy when bits and pieces of food get revamped into meals like this! Corned Beef and Cabbage Slow Cooked Recipe – A delicious traditional Irish meal slow cooked. Mexican Beef Cabbage Soup – A low carb stovetop beef cabbage soup with a Tex-Mex flair. 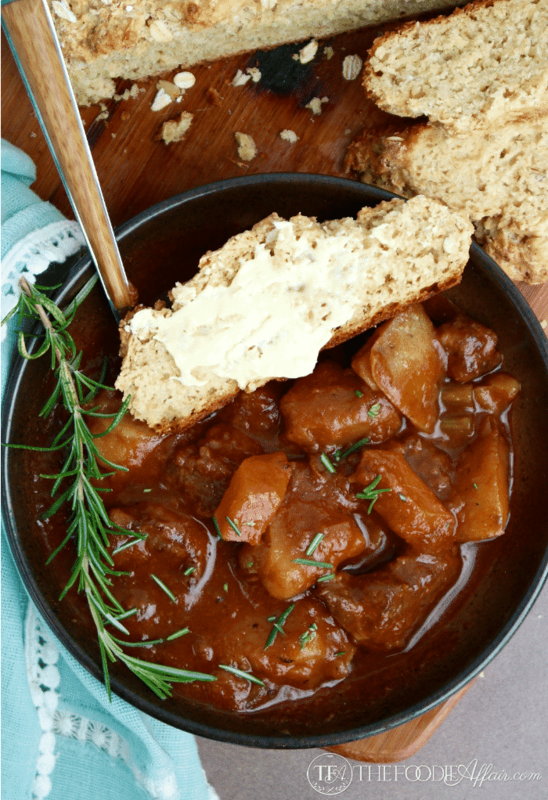 Beef Stout Stew – A hearty stew with Guinness beef. A creamy and delicious corned beef stew made from the leftovers of a traditional Irish meal. Melt the butter in a large pot over medium high. Add the diced onion, celery and carrots (if using fresh) and stir occasionally until the vegetables are slightly softened (about 5 minutes). Stir in the flour and cook for 1 minute. Slowly stir in beef broth and milk, bay leaves and thyme. Bring to a simmer and cook until it begins to thicken. Add diced potatoes, corned beef and cabbage. Simmer until warm 10-15 minutes. 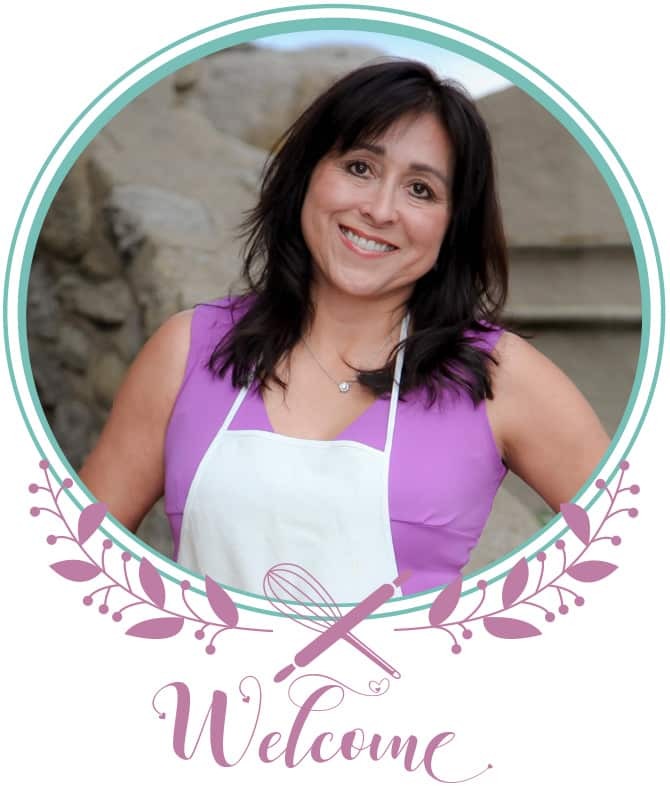 This recipes gives you the option to use all leftovers or you can incorporate fresh ingredients. If you use leftovers add just to warm at the end of cooking time. This is what my mother made every St. Patrick’s Day when I was growing up. What a treat it was and that was the only day she made it during the year. 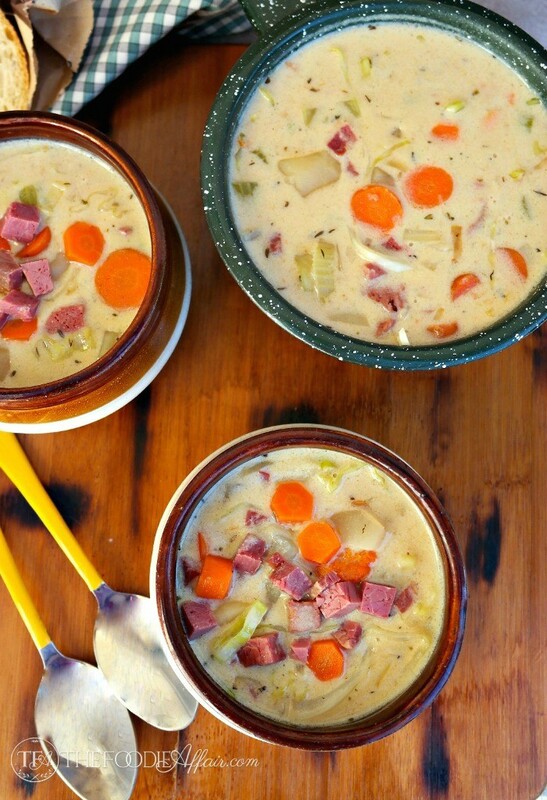 I loved your corned beef and cabbage recipe but I love this creamy and rich soup even more. Mom’s are just amazing as they can find something almost like magic stone soup in the refrigerator. My parents went through the depression so they are very used to making use of everything. This chowder looks amazing. Thanks for the great instructions and your pictures look great! A great way to use leftovers. The chowder must be very hearty and warm! A filling and comfort soup, great idea. I love leftovers, usually add some garden fresh vegetables and enjoy another great meal without much effort. I’d cook a corned beef JUST to make this soup! Looks so good!! My husband is not much for leftovers, and you are right, sometimes it really takes a creative mind to repurpose them into something new! What a great way to use leftovers! We love soup, so I know we’d love this!! Sandra, that looks absolutely delicious and so comforting! I love taking leftovers and turning them into something new and exciting! 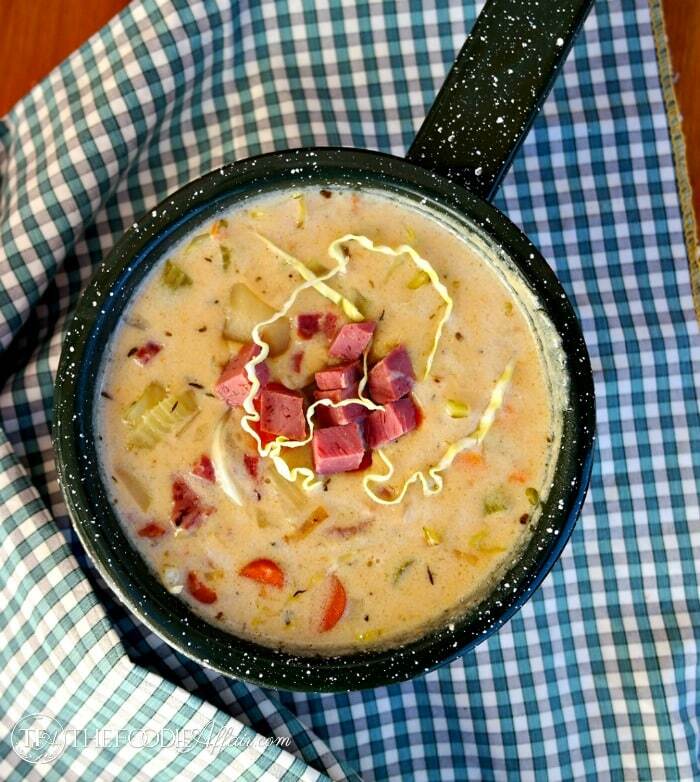 This corned beef chowder looks divine! I’m not a real fan of the corned beef boiled dinner. This looks like a much better option. Delicious! Love this recipe, I’ve taken the leftovers from the soup and blended them up. I did it on a Sunday so we’ve called it Cream of Sunday soup ever since. This sounds and looks amazing. I loved eating corned beef and cabbage as a kid but my husband refuses to eat it and my kids won’t eat cabbage so I never make it. I miss it! My dad loved corned beef and cabbage. I am going to send this to him. 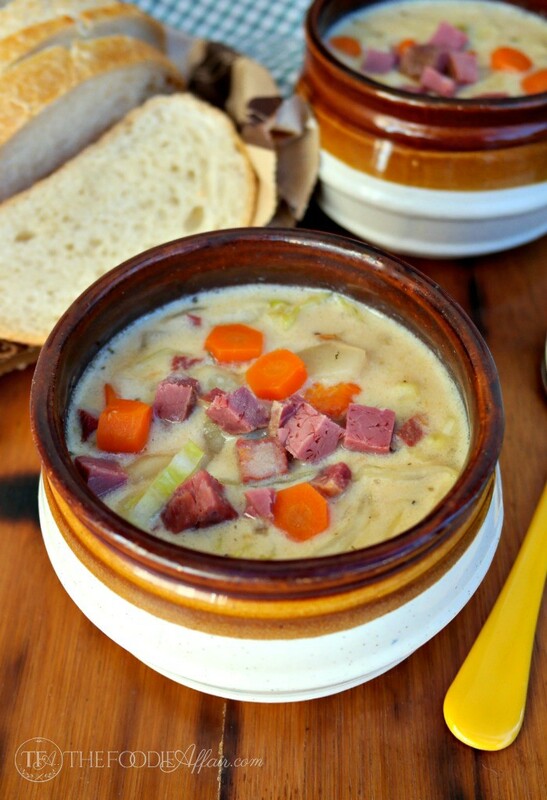 Corned Beef and Cabbage Chowder is a fantastic recipe for today or any day! I thin you have a tad of Irish heritage in you! Great recipe! Wonderful soup. Served with crusty bread and it was all we needed for dinner. What a great use of leftovers. So simple to make. My husband walked in from work and said ” something smells good”. I am lucky to be married to a man that enjoys a hearty soup for dinner. I make this using the leftover boiling liquid from the corned beef and cabbage dinner. It gives the soup so much flavor! We just love it. That’s a great way to use all the ingredients from a delicious corned beef meal! Excellent recipe. Family loved it. Used pamelas gluten free flour as substitute for flour. Turned out phenomenal. What a fun and creative way to use leftovers! I love turning something leftover into something new! thanks! This soup is exactly the kind of foud that I grew up eating. There wasn’t any stigma in using leftovers and we sure don’t mind having amazing recipes like this one! I have a feeling I’ll be buying tons of corned beef this week! This has all of the things I need in a good soup! Ive put everything on the grocery list so I can make it this week! Hope you love this as much as we have! What a wonderful story! Sometimes leftovers make the BEST meals! Love how you made such a wonderful soup. 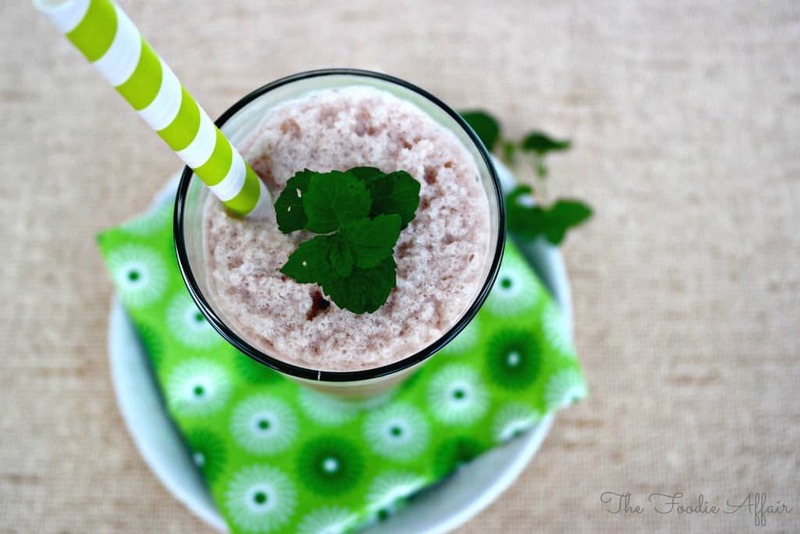 I can’t wait to give this a try with our St. Patrick’s Day Leftovers!!! I love this so much. Creative ways of using up leftovers is my jam! This is so good! We love this chowder and it’s really easy to make too! I am going to need to grab another corned beef!! Going to need those leftovers to make this chowder!